Last updated on March 10th, 2019. 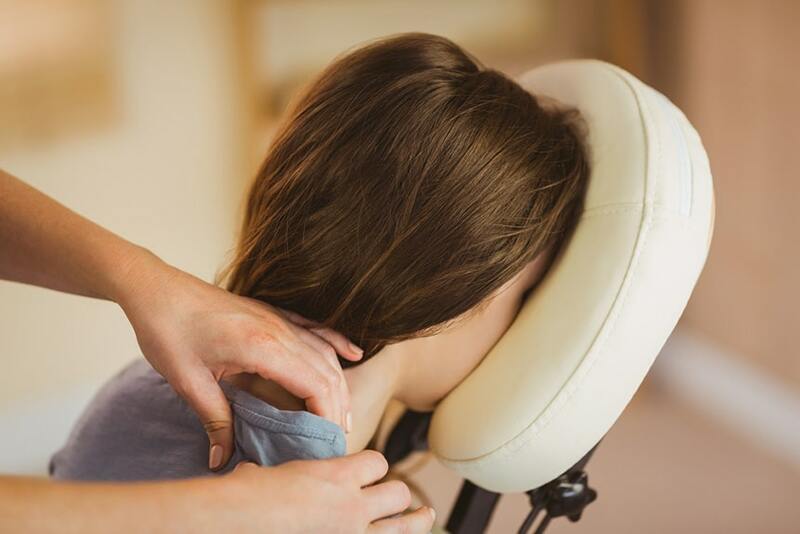 Whether you are a massage therapist looking for a portable massage chair to increase your business or just someone who wants a comfortable option for lounging at home, there are so many options it can be confusing. 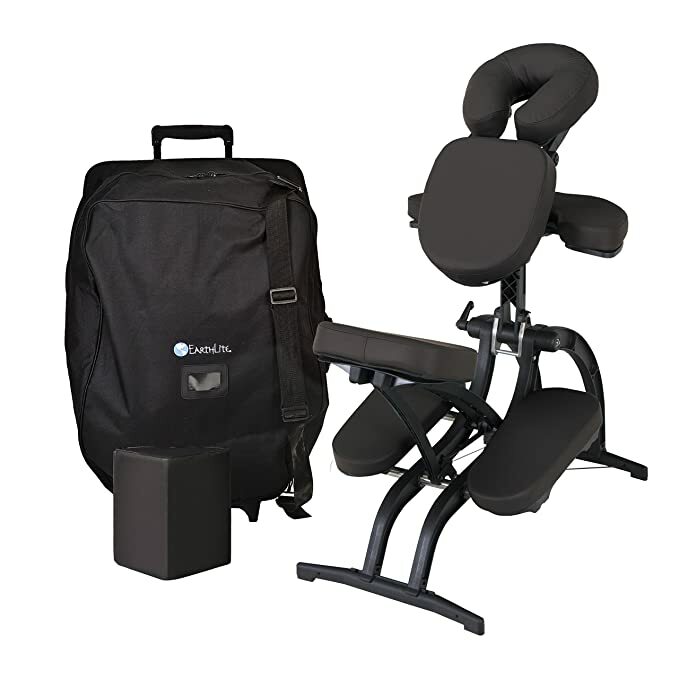 Choosing the best portable massage chair for your needs is important, so here are a few critical factors to consider before you start shopping. Ease of Use and Adjustability. How much you want to spend on a portable massage chair is directly related to what you want to get out of it. Portable massage chairs come in a wide range of prices, so you can spend hundreds of dollars or under a hundred dollars, based on your budget. If you only want it for occasional or home use, it makes little sense to go for the highest-priced model. But if you plan on using it weekly, you may want to consider investing in a model at a higher price point that comes with a warranty, so that you can have repairs made easily when parts wear out over time. On the lower end, you can expect a lighter-weight chair with thinner cushions and less adjustability- so, less comfortable for longer sessions. The least expensive portable massage chairs will almost certainly be less durable, may not be rated to hold heavier clients, and won’t have any sort of warranty. On the higher end, you can expect a much heavier and more stable chair with more adjustability- so, more comfortable for longer sessions, but also harder to transport. The highest-priced portable massage chairs are rated to hold heavier bodies, and will definitely have a limited lifetime warranty, which can add a lot of value over time. In between, you will find a variety of features that will determine which chair is best for you. 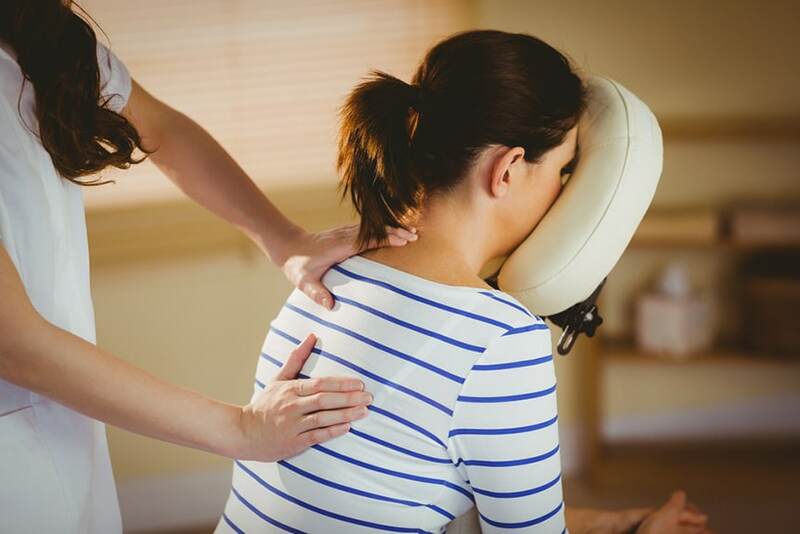 One of the most important questions to ask yourself when shopping for a portable massage table is where and how you will use it. If this chair is for your home, then weight and bulk isn’t an issue. If you want a chair for its portability, you need to pay more attention to this feature. For example, if you have a weekly gig at a corporate location, and that’s the only place you do chair massage, then buying a bulkier, heavier chair that you will store on site makes sense. If you want to travel to locations that require a lot of walking and carrying, you will definitely want to look for a lighter model that is easier to set up and break down. When looking at the weights of portable massage chairs, that difference of 1-5 pounds may not seem like much, but after carrying it on your shoulder for half a mile, it makes all the difference in the world. How you want to use a portable massage chair will ultimately determine what level of adjustability and ease of use you need. Honestly, more adjustments are not always necessary. If you want a chair for home, then this is only a consideration related to which adjustments you need for comfort. If you only offer only short sessions of 5 to 10 minutes, then only basic adjustments are actually needed. If you are doing longer chair massages with breaks in between, then a chair with greater adjustability is more important. All portable massage chairs have the same basic shape and features: knee rests, seat, armrests, sternum (chest) pad, and face cradle. Despite these visual similarities, the adjustability of massage chairs varies wildly. 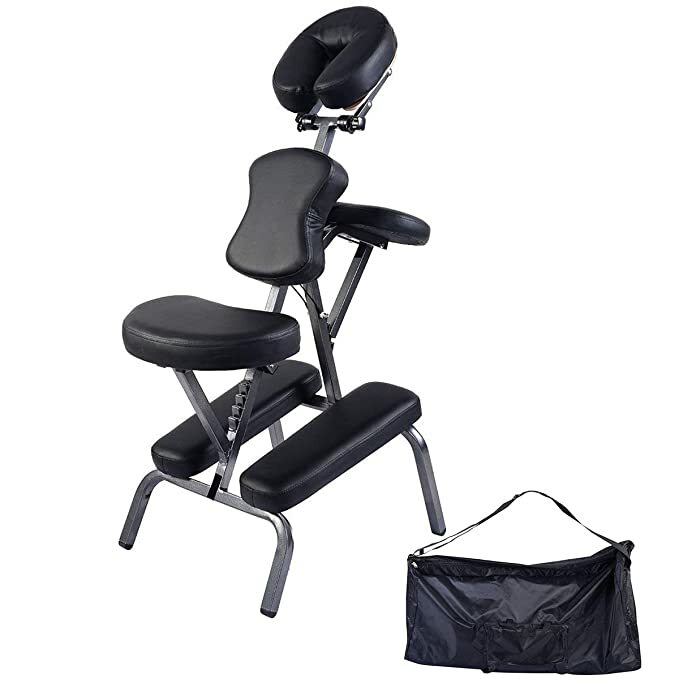 Some of the adjustments available on portable massage chairs include: seat height, face cradle angle, chest pad height, knee rest height, and armrest height. Each model will have strengths and weaknesses when it comes to how adjustable they are. Also, some of these chairs are easier to adjust than others. 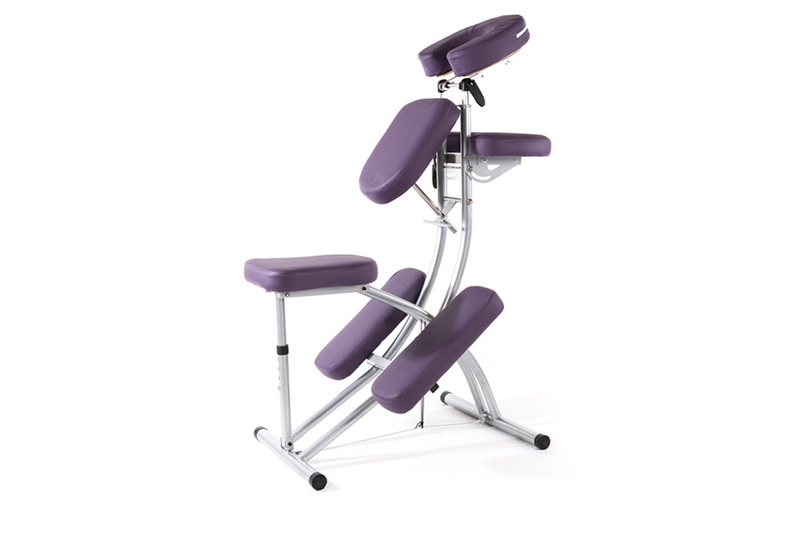 If you are doing short chair massages with no real break in between (like at festivals and events), you don’t want to waste time with fussy adjustments. But if you perform longer sessions with reasonable breaks in-between (as is normal for corporate gigs), then you can take your time with more precise adjustments. If you only want this for your home, then you may want to look for a combination of comfort and value. Portable massage chairs are designed to be comfortable for average-sized people. However, the ranges in thickness of cushions, adjustability of parts, and working weight ratings will definitely affect the comfort of your clients. Figure out who will be using this chair the most before you buy a chair. When choosing a chair for home, you just want it to be right for you. If you want to work festivals, it is reasonable to assume that your clients will be younger and your sessions shorter. If you work on corporate clients, you may work on more men than women (so, larger and taller), and your sessions will probably be longer. If you are working on professional athletes, you can assume they will be taller. For massaging children and youths, you will need a chair that can be adjusted to a shorter height, and it is possible you may need additional seat pads for anyone under 5 feet tall. If you want to work in a medical clinic, you may end up with much heavier clients, so you will want to make sure that you purchase a chair that can accommodate higher weights. Thicker high density foam cushions will make heavier clients more comfortable for longer sessions, as will larger seat sizes and wider, more adjustable chest pads. 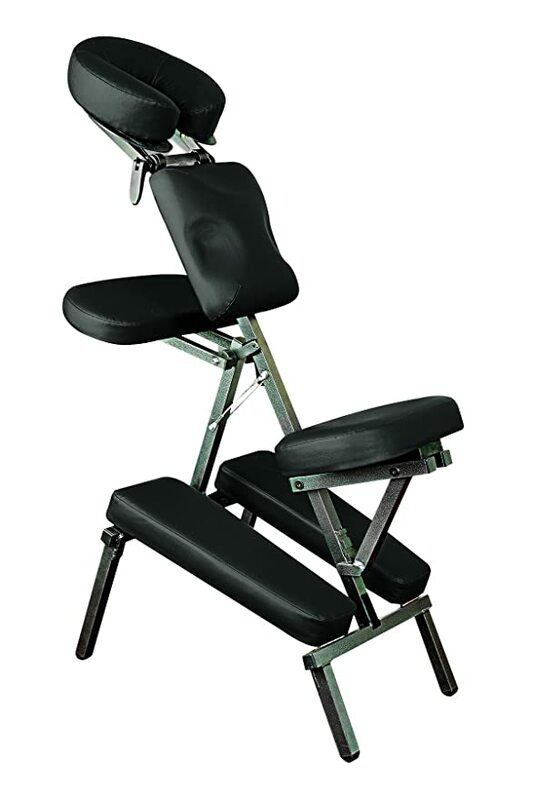 For shorter or taller clients, make sure you buy a portable massage chair that has adequate adjustments for height. If you don’t know who your clientele will be, then it is best to choose a model that offers sufficient comfort options for a wide range of body shapes and sizes. 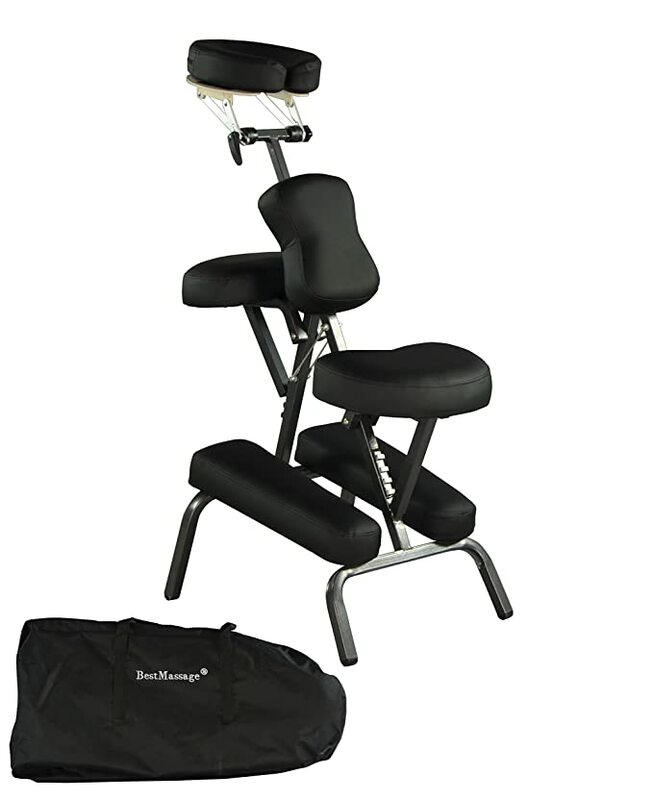 The first portable model we’d like to introduce is the Earthlite Avila II Portable Massage Chair Package. This company has been around for over 30 years and is trusted by massage therapists everywhere. Incredibly adjustable: features a sliding, tilting chest pad, a fully adjustable face cradle, and an adjustable armrest. Verdict: This portable massage chair is best suited to a therapist who plans to set it up and use it often in one location. It has a high-end feel and superior comfort, but at the expense of portability and ease of adjustment. I do not recommend this for occasional use or for a great deal of travel. 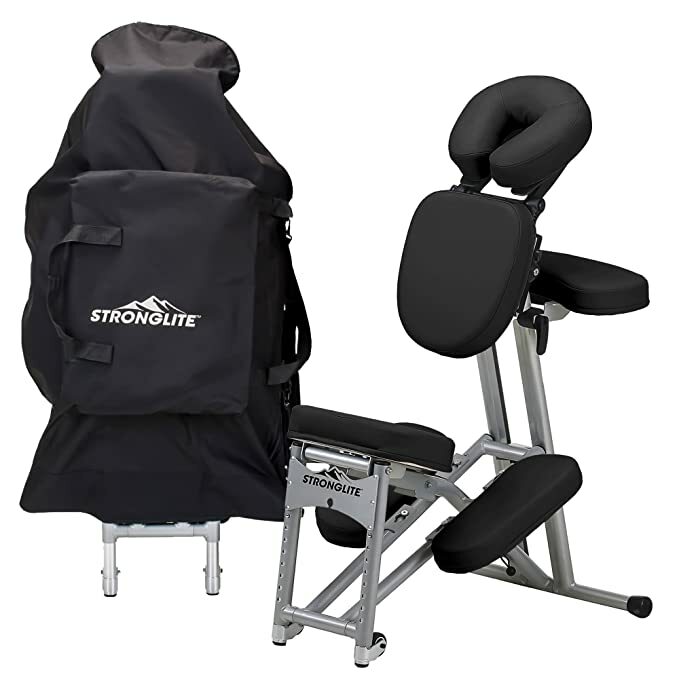 Next up is the Stronglite Ergo Pro II Portable Massage Chair Package. This company has been around longer than almost anyone in the business, and has some of the highest ratings of any of the massage chairs available on Amazon. Verdict: This is a great portable massage chair for a therapist who works on heavy people or people with injuries. It can be rolled easily on a flat surface, so it’s perfect for paved areas or indoor floors. I would not recommend this for a therapist working festivals or outdoors, because it is heavy and would not be fun to carry long distances. This product gets solid 4-star ratings on Amazon. It offers great value and great portability. Verdict: This is a wonderful portable massage chair for home use or for therapists starting out in chair massage who haven’t determined their target market. It offers great value and ease of use, but not as much durability or comfort as some of the other models out there. I would not recommend this item for a therapist working on high-end clientele or in a high-volume setting. The Master Massage Professional Portable Massage Chair hits all the right mid-range spots, and is well-reviewed on Amazon. It offers a combination of quality features and solid value. Verdict: This portable massage chair is just right for the therapist who works at occasional events and needs something light but durable. It offers a high level of comfort and durability and good value. I don’t recommend this for therapists doing a high volume of work, or working on a large number of very tall clients. 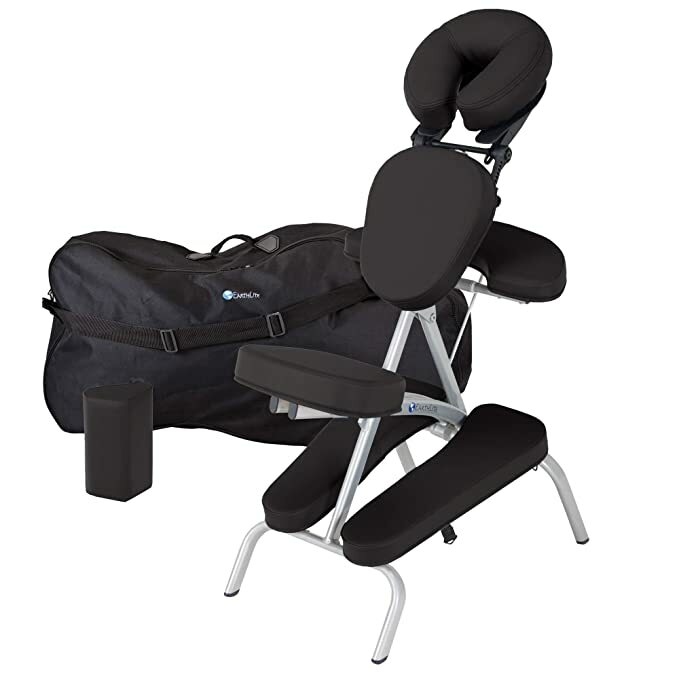 The Earthlite Vortex Portable Massage Chair Package is available on Amazon Prime in seven different colors. It is one of the highest-rated portable massage chairs available from one of the oldest and most trusted names in massage chairs. Verdict: This is an ideal portable massage chair for a therapist who gets around. Its lightweight construction makes for easy travel, even when toting it over longer distances. It is attractive, durable, and versatile enough for clients of all shapes and sizes. It might be a little too much of a purchase for someone who only wants a massage chair for home use, so I would not recommend this option for a non-professional. The NRG Grasshopper Adjustable Massage Chair is a mid-range portable massage chair available on Amazon. It features simple, elegant design, good value, and is well-reviewed– especially considering its lesser-known manufacturer. Verdict: This is a great-value portable massage chair for a therapist who plans on using a chair frequently in different locations. Its versatility and quality are suprising for a lesser-known brand. I wouldn’t recommend this chair for a therapist who wants a longer-term warranty or a recognized brand-name chair. Last, but certainly not least is the Giantex Portable Light Weight Massage Chair. It is available on Amazon and is well-reviewed and offers good value. Verdict: This is a good portable massage chair for a beginner who doesn’t want to invest a lot of money until they know for certain that they will be doing a lot of chair massage, or for home use. Its relatively heavier construction and less durable build makes is a poor choice for a professional who does a lot of chair massage in various locations. With all of the portable massage chairs on the market, there are some clear winners out there. For a combination of durability, comfort, and value, my money is on the Master Massage Portable Massage Chair or the Earthlite Vortex. 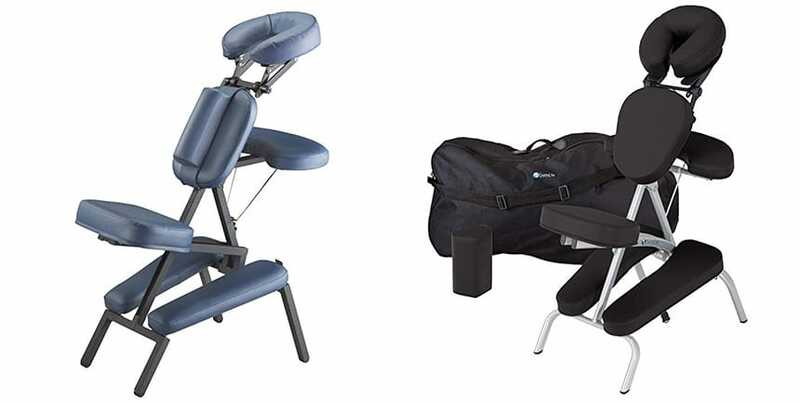 Both offer a lightweight option for the truly mobile massage therapist, plus a high level of quality and exceptional comfort. It’s a tough call, but what tips the balance is the fact that the Vortex is offered with free shipping on Amazon Prime, so what you save on shipping you can invest in a chair with a lifetime warranty. 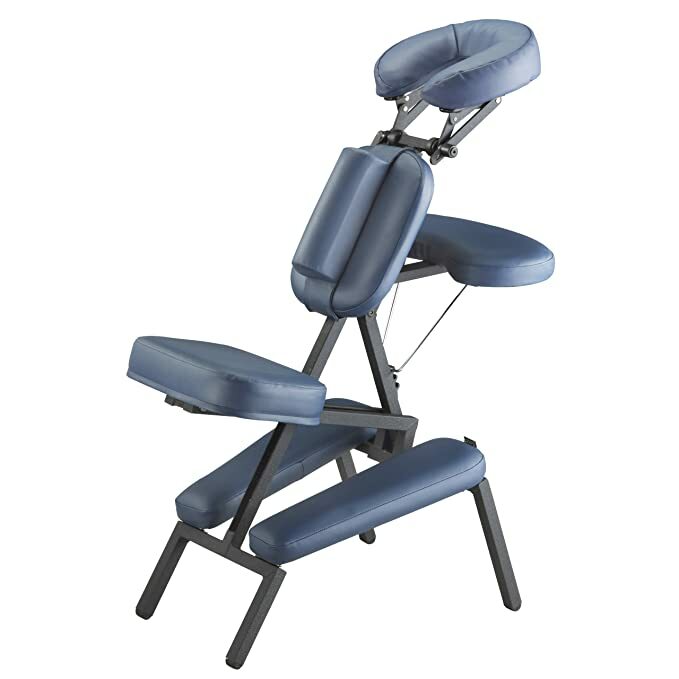 Whether you are thinking about adding chair massage to your repertoire or are just looking for more lightweight backup, this is the chair for you! Go buy this portable massage chair today, you will not be disappointed.